Have you ever heard of the Maxwell-experiment? No, you couldn’t possibly have, since its intellectual father quickly backed down after it didn't work out. Today one speaks of the Michelson-experiment and it may be connected with many other names (Morley, etc.). Remember: In his light theory Maxwell had determined a particular and constant value for the speed of light, and for that there should be a physical reason, which should have its cause in the aether. By means of proving this aether, Maxwell wanted to prove his theory. But this enterprise thoroughly failed. The thought was as follows: If the Earth is spinning and is moving through the cosmos, then one should be able to detect an aether wind and different values for c in the different points of the compass. Maxwell found support for his project at the observatory, since with the aberration of the stars Bradley had previously described an observation which could be considered as evidence for an aether. The director of the observatory charged his assistant Dr. Michelson with the task, to carry out a corresponding proof of an aether, this time in a terrestrial experiment. But such an aether couldn't be proven and Maxwell had to accept this as a severe blow to his light theory. However, seven years later, Maxwell received acknowledgement from a completely different place by means of Heinrich Hertz’s experiments with radio transmissions. To this day, the astrophysical question of the aether has remained open, whereas its detection within terrestrial laboratories casts doubt upon the existence of an aether. But the aether can't be abolished so long as it remains unsettled why light propagates with, of all possible velocities, value c. The question is asked, what determines the propagation of light from today's point of view? Now, by means of outside fields, light can be slowed down. At present, the world record lies at less than 65 kilometers per hour in a Bose-Einstein condensate. If electromagnetic fields determine the speed of light, and if in addition a field or gravitational lenses should confirm this, then the field takes over the task of the aether! At this point the new field-theoretical approach shows its capabilities. The equations of transformation say nothing but that a moving H-field transforms to a resting E-field, and vice versa; that thus, in the place of a moving aether, the aether wind, a resting aether is found. Doing so, the dual field partners merely exchange their places. Therefore, when we try to measure the aether wind which underlies the same field with gauges, it is a wild-goose chase. Michelson had to fail. If electromagnetic fields determine the speed of light, if in addition field or gravitational lenses should confirm this, then the field takes over the task of the aether! At this place the new field-theoretical approach shows its capabilities. The equations of transformation say nothing but that a moving H-field transforms to a resting E-field and vice versa, that thus in the place of a moving aether, the aetherwind, a resting aether is found. Doing so the dual field partners merely exchange their places. Therefore it is a wild-goose chase, wanting to measure an aetherwind with gauges, which underlie the same field (fig. 28.2). Michelson had to fail. Seems like there's something wrong with my translation. I don't quite get it. Any ideas? It is important that experts try to solve problems. Only if the discussion about limits doesn't come to a result which can be grasped and verified, then also in the environmental compatibility the willingness will grow, to accept a not yet known phenomenon as a further and possibly crucial influential factor. Already for a hundred years there has been a dispute between experts. At that time scientists all over the world were trying to verify the experiments of Heinrich Hertz. Then from America came the message that Hertz had been mistaken and the electromagnetic wave possessed completely different properties. Europe’s scientists were indignant, but they had to take the message seriously because it after all came from the important experimental physicist, Nikola Tesla (1856-1943), who with his inventions of the rotary field and of the asynchronous motor has affected today's electric energy technology like no other. As a result, Lord Kelvin boarded a steamship as a mediator and sailed in 1897 to New York to convince Tesla that he was wrong. But the experiments which Tesla presented his Lordship didn't leave any doubts, and thus Kelvin returned to Europe with the message: "Both are right, Tesla as well as Hertz! Whereas the electromagnetic wave which Hertz has detected, is a transverse wave, Tesla works with a longitudinal wave!" Lord Kelvin as a result started to draw very different vortex models, because it was clear to him that propagation as a longitudinal standing wave analogous to the sound wave is only conceivable if quantized structures exist, which mutually knock each other. Kelvin therefore assumed vortex structures of the electromagnetic field. His vortex models were published and landed in the curiosity box of orthodox science. Heinrich Hertz did have a big advantage. He could refer to Maxwell and calculate his wave with the field equations. For modern technology, its mathematical calculability is almost an indispensable prerequisite! For Tesla’s wave there however existed neither a mathematical nor a physical theory. The only thing Tesla had were presentable experiments. In Colorado Springs, he had built a 10 kW transmitting installation and lit 200 fluorescent lamps of 50 Watts each on a mountain in the Rocky Mountains at a distance of 25 miles. With that he had completely transmitted 10 kW of transmission power, as can be inferred from the press reports at that time. Even after over 100 years, this experiment would not be technologically possible with Hertzian waves, which propagate spatially. According to the law of the square of the distance, one isn't even able to make glow a tiny little lamp at such a distance. For sure, his rotary field theory was a big help for Tesla in all of his experiments. And in fact, a rotary field can be seen as the special case of a planar vortex. Thus, Tesla obviously was able to use the potential vortex without even knowing it. Tesla has stimulated a loosely coupled high tension coil wound like a spiral to self-resonant oscillations and emitted the produced vortices over an antenna (fig. 9.1). On the receiver side the process was then reversed. What is the rotary field? The correctness of a new theory can not by all means guarantee that it also is accepted! A new theory must be used. An acknowledgement is to be expected only if a concrete need exists, and only then by the direct beneficiaries. In November 1994 in Munich, the trade fair "Electronica" took place. Here, invited by the Deutschen Gesellschaft fur EMV-Technologie (German association for EMC-technology, note of the translator), books written about potential vortices [Al, A2] were honored with a prize by an internationally renowned EMC-scientist. The number of people who the potential vortex theory helps further to find answers to problems, which until now have remained inexplicable, grows further. Nevertheless, nobody should believe that the textbooks on the shelves will be changed that fast. Habit and laziness encourage us to further use dominant interpretation, even if a new theory demonstrates a better and convincing answer. To give an example, it will take some time until the heating of water in a microwave oven is explained as eddy losses, as it is properly described by the potential vortex theory already today. The discovery of a physical phenomenon may happen in a fright second. Its acknowledgement, on the other hand, as a rule is a lengthy procedure. If we look back in history we find out that even in the past it hasn't been otherwise. Of the four fundamental phenomena in fig. 8.2 at first the tension voltages and the charges have been discovered by Coulomb (5.7e). (5.7c): An effect of the eddy currents was observed already in 1825 by the French physicist Arago. He discovered that a magnetic needle suspended above a rotating disc tends to rotate along. Out of ignorance, he named the effect "rotational magnetism". But the eddy currents could only be mathematically described with the help of two laws, the law of Ampere (1820) and Faraday’s law of induction (1831). Because the effect due to the eddy current losses was instead regarded as disturbing, technical applications or patents were impossible. Riidenberg first carried out fundamental calculations for eddy current brakes in 1906. The discovery and usage of the "skin effect" is to be attributed to Tesla. (5.7b): The electromagnetic wave for the first time was mathematically described by Maxwell (1864). He had aimed to calculate light and he could show that his theory actually could correctly describe all properties of light. With that he was able to prove the correctness of his theory. But he had to deal with many sceptics, because he had postulated the dielectric displacement, without ever in his lifetime being able to measure it due to its smallness. This may be the reason why the discovery is attributed to Heinrich Hertz and was and is spoken of as the Hertzian wave. Neutrally seen, Hertz at first was nothing more than an enthusiastic pupil who had worked through Maxwell’s "Treatise". All results which Hertz could observe experimentally were already contained in the Maxwell-theory and published. But Maxwell’s great mathematical description at first had a purely academic importance. The interest of the general public on the other hand concentrates on practical applicability. Hertz had experimented with antennas and has laid the foundations of the building of a gauge for electromagnetic waves (1888). The wireless transmission of invisible waves was convincing. It was an entirely new technology, which stimulated fantasy in view of a technical usage. Marconi was a practical man who was stimulated by theoretical realizations. He invented the radio (1895, Nobel prize: 1909). Between the three achievements -- first the calculation, second, and at the same time the discovery and measurement, and third, the application of the wave phenomenon -- lay 31 years. And radio technology is developing still further, even today. A gold-mining mood prevails in the area of the cellular phone network and in telecommunications, which is barely affected by hints of electromagnetic environmental compatibility issues. Amidst the euphoria of the past 100 years and completely fallen into obscurity is the fact that besides Hertz’s detection of the transverse wave in the wave equation according to Laplace and according to the original version of Maxwell, a longitudinal wave was also mathematically described. This one was discovered and detected by Tesla in numerous experiments. With reference to his discovery, Tesla had initially publicly asserted that Hertz had been at fault, an assertion that the scientific community believed to be undoubtedly wrong and for which he was scorned. As a result of this development, his experiments haven't been reproduced and the discovery of the scalar wave would fall into oblivion. Not enough, with such sanctions against the inconvenient freethinker Tesla, a series of professors like Gibbs and Heaviside have made cuts and discarded all parts from the original version of Maxwell’s Equations, which at that time weren't considered to be experimentally proven by experiments of Ampere, Faraday, Ohm and Hertz. With those changes, scalar waves fell victim to the axe even though the changes had encountered severe criticism. Once Hertz also sanctioned these measures, they were finally codified as textbook opinion into all textbooks. If the field equations according to Maxwell in today's revised version don't describe scalar waves anymore, then all orthodox scientists who want to make reference to the revised Maxwell’s Equations have to bear one thing in mind: discarding a term of an equation is the same as neglecting it. But the term may only be neglected if it is sufficiently small. The first thing every student learns in his physical practical training is that of testing. For that, the term has to be measured and its order of magnitude must be determined. It’s of little help and even extremely unscientific if on the basis of the revised field equations, which have put all scalar waves to zero, it’s demonstrated that the neglect was allowed or even necessary. A practical example is the longitudinal wave parts, as they occur and are proven in the near-field of transmitter antennas. Considering their order of magnitude, neglect is out of the question. On the other hand, they should not exist at all according to textbook physics because they had fallen victim to the axe. Since most scientists in the present time are no longer aware of their removal, they are postulating field vortices anew in the proximity of an antenna. Field vortices propagate longitudinally in the direction of a field pointer as a scalar wave. With that they calculate their own arbitrary assumption. If in the practical training of physics, a student neglects an essential factor of influence, then his experiment fails. The experiment must be repeated until, according to the approved methods of scientific soundness, all used neglects have been tested individually and have undergone an error consideration. Do we now have to deny the cutting action, which had been plotted by Gibbs, Heaviside and others, as having the necessary scientific soundness? Do we have to review and rework all textbooks concerning the illegal neglect? Since the cutting action a gap gapes in the field theory! (5.7d): The potential vortex fills the remaining gap in fig. 8.2. Several scientists can be named who could already observe this phenomenon: most prominently, Nikola Tesla, for his discovery of Tesla currents, where very weak currents are said to cause extremely high potentials. Here, presumably cause and effect have been mixed up, because weak currents can never produce high potentials. Actually, the potentials prove to be a result of the potential vortices, whereas the currents aren't more than a side-effect, nothing but leakage currents. Even though Tesla could use the vortex, without a usable theory he could neither calculate nor adequately explain it. Besides Tesla, Wilhelm Reich, who has collected the vortices in his orgone accumulator, should be mentioned. For the most part, only certain aspects were observed and investigated: the planar vortex by Tesla, the influence on the weather by Reich, the water vortices by Schauberger, and by all three their medical and biological aspects. The list of names is incomplete and could arbitrarily be continued. With the discovery of the potential vortex in 1990, the basis for the building of a gauge and the technical application of the physical phenomenon is prepared. It not only concerns the search for water, but also the detection of the vortex balls and vortex streets, of the standing waves of the energy radiation in the air, at the workplace, in the bedroom, in clinics, in recreational areas and in hotels. As explained at the start, neither the field strength of a Hertzian wave nor the arising heat development can be made responsible for biological or technical harm. It’s primarily the newly discovered vortices of the electric field which take effect. The effects can, as we have seen, be both good for health as well as bad for health. Intensity, plane of polarization, vortex configurations and many other characteristics play a role here. Vortex gauges will be needed to research these influential factors. We have to realize that in the technical domain the electromagnetic compatibility of an apparatus is determined by its sensitiveness to vortices, thus by the fact how many and which vortices can cause a function trouble. To determine the environmental compatibility of a product, the emitted vortices, the energy radiation, have to be measured. Limits for high tension lines and for screens or handheld phones must be given in units of the potential vortices. The potential vortex has shown us the way to a unified theory and has brought along a new picture and understanding of our environment. It wants to show us an ecologically compatible way of using scalar waves in nature. Your translation is fine and you will get what he means. But it is difficult to condense the subject matter as you can also see in the thread you made about Maxwell. The Hafele–Keating experiment was a test of the theory of relativity. In October of 1971, J. C. Hafele and Richard E. Keating took four caesium-beam atomic clocks aboard commercial airliners and flew twice around the world, first eastward, then westward, and compared the clocks against those of the United States Naval Observatory. eastward direction it should be added (eq. 13.1). planes doesn"t play a role. It is cancelled out. doesn't appear in the calculation at all! disappoint. The determination of the linear measures equally ends in a fiasco. solving the problem of stability of Royal Library (now National Library) in Vienna. Italian, he hastened to correct him. (philosopher and political writer), Joshua Reynolds (the first president of the Royal Academy of Arts), and others. showed him some of his electrical experiments, see an article by Branko Franolic. church of S. Maria Podone in Milano. (Commonplace Book), accepting his atomistic theory. The diary is kept in the archives of the Royal Institution in London. Also a famous Irish mathematician and physicist R.W. Hamilton wrote extensively about Boskovic's theory of forces. the course of last fifty years. This graph was since 1763 called the Boskovic curve (curva Boscovichiana). (stating that the best fitting line is the one with the smallest sum of squared residuals). of the Church of England, and visited Oxford and Cambridge. Boskovic a Fellow, a month after he had reluctantly left England (on 15 December 1760). to Boskovic's theory of natural philosophy, set out in his seminal work Theoria philosophiae naturalis . . .
* The Aberration of the Fixed Stars (1742). of similar surveys in the Papal States, the pope taking this means of retaining him in his own domain. particles, but of innumerable point-like structures whose individual components lack all extension and divisibility. A repulsion exists between them which is indeed infinitesimal but cannot vanish without compenetration taking place. then pointing out his applications to mechanical problems, and finally showing how it may be employed in physics. 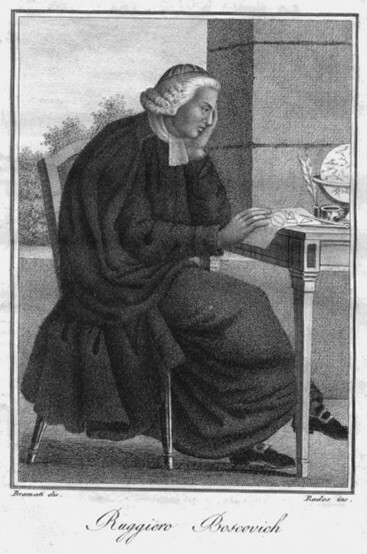 that in 1763 a third, and enlarged edition of his "Theoria philosphiae naturalis" (Venice, 1763) had become necessary. parum a se invicem remotarum (Paris, 1774); De recentibus compertis pertinentibus ad perficiendam dioptricam (1767). * Opera pertinentia ad opticam at Astronomiam maxima ex parte nova et omnia hucusque inmedita (1785). This part is more of a bridge from the previous page to this one and is not really necessary for the content of the page. all used neglects have been tested individually and have undergone an error consideration. He is questioning here the reasons and validity of neglecting parts of mathemetical representations of physical models for the mere fact of simplification. Which is done in more fields of science. And with that running the risk of using a equation which will not describe the subject correctly and thereby drawing the wrong conclusions. plain electromagnetic interference in German vortex slang. think of conductor losses in the for of heat or just walk around your Hertz-antenna and see what interferes. What are your thoughts about learning David Thomson's Aether Physics Model? Is there something in particular that is holding you back? It seems to me that if you already understand Meyl, then you understand how to work with scalar waves in a computational manner. But, you won't fully understand why those equations work until you actually attempt to learn a model for the aether's structure. From what I can tell, Meyl doesn't offer that. David Thomson is the only one who offers that, and from what I can tell so far, the APM is pretty much compatible with Meyl's scalar wave work. The APM uses the exact same data as quantum physics. Thomson just provides the aether perspective for that data. The idea that the physical constants derive from the geometry of the aether is so fundamental that it is difficult to argue with. Thomson's claim that there are two separate charge carriers is based entirely upon the fact that electromagnetic charge tends to distribute over the surface of a conductor. The proper dimension for electromagnetic charge is in fact e^2. If you don't correct for this problem, it will lead to others. I see much logic in Thomson's approach, and we need more people like you, who are already familiar with Meyl, taking a look at his work. I feel strongly that *both* the APM and Meyl are the future of the Electric Universe. I think that they say the exact same thing from two different perspectives, and that both are compatible with the EU. We have to start this process of synthesizing all of these theories together, and the first step, IMHO, is convincing people to learn all three. plnbz wrote: [What are your thoughts about learning David Thomson's Aether Physics Model? Is there something in particular that is holding you back? It seems to me that if you already understand Meyl, then you understand how to work with scalar waves in a computational manner. But, you won't fully understand why those equations work until you actually attempt to learn a model for the aether's structure. I would not mind getting to know his Model, but time is short. Could you point me to the best places to inform myself concerning Thomson? plnbz wrote: From what I can tell, Meyl doesn't offer that. David Thomson is the only one who offers that, and from what I can tell so far, the APM is pretty much compatible with Meyl's scalar wave work. The APM uses the exact same data as quantum physics. Thomson just provides the aether perspective for that data. The idea that the physical constants derive from the geometry of the aether is so fundamental that it is difficult to argue with. Thomson's claim that there are two separate charge carriers is based entirely upon the fact that electromagnetic charge tends to distribute over the surface of a conductor. The proper dimension for electromagnetic charge is in fact e^2. If you don't correct for this problem, it will lead to others. Meyl has ideas about an "aether", but I'm not sure of course what Thompson says about it, and if/how they differ. What do you mean by using data as quantum physics? The physical constants derived from geometric relations sounds quite familiar, in a way. plnbz wrote: I feel strongly that *both* the APM and Meyl are the future of the Electric Universe. I think that they say the exact same thing from two different perspectives, and that both are compatible with the EU. We have to start this process of synthesizing all of these theories together, and the first step, IMHO, is convincing people to learn all three. I know the feeling. Although it still have some troubles determining how far that compatibility goes. Also I really would like to here Thornhill more about how he imagines the neutrino-sea he states and the practicality of such an neutrino-sea. Meyl also goes in that direction in a way, but if it is meant the same. How do you see such an synthesizing of theories apart from the learning of the different models? And is it something for in this part of the forum or ought it be done in the Mad Ideas section? Little confused about that. There was a little story I came across that in a way was familiar in regard to the 'aether'-discussion. "How tedious and monotenous you are! The only way currently to learn the APM is to purchase "Secrets of the Aether" for around $60. I've been moving through the text. David Thomson generally responds to requests for assistance, so you get support with your purchase. I've found that a conceptual understanding of physics is helpful -- possibly even necessary -- to move through the work. You will need to understand what all of the major concepts of physics are -- things like permitivity, strong force, Plank's constant, etc. At the same time, however, there are advantages to learning these things along the way: our minds are actually unable to ignore any prior knowledge we've gained about these things which may interfere with understanding the APM. I'm taking the approach of learning quantum mechanics concepts with the APM, at the same time. There is a set of data associated with quantum mechanics which is somewhat undeniable and lacks any controversy. The real difference is in how you interpret these things. Thomson generally does not dispute these items. But, there are also apparently serious problems with quantum mechanics: like the act of modeling charge and particles as point sources, the idea that collisions can tell us *everything* we need to know about the particle domain, the idea that particles are merely composed of more particles (as opposed to more fundamental concepts) and the sloppy usage of units. Even if Thomson is wrong on key points, many of these strategies are surely on the right track. Also I really would like to here Thornhill more about how he imagines the neutrino-sea he states and the practicality of such an neutrino-sea. Meyl also goes in that direction in a way, but if it is meant the same. How do you see such an synthesizing of theories apart from the learning of the different models? And is it something for in this part of the forum or ought it be done in the Mad Ideas section? Little confused about that. In my own opinion, we should not consider discussions of the particle domain as a Mad Idea. There needs to be a push to extend the Electric Universe into the particle domain. It should be considered a natural evolution for the Electric Universe -- the next big item on the long-term roadmap. The reason is that the public expects technology to follow from science. Science in the absence of technology that demonstrates it is comparable to software "vaporware", and it will be dismissed by the public. There are very few technologies that can follow from the Electric Universe alone. The field of quantum computing is an example of trial-and-error science. If we can leverage our understanding of the EU to guide us to a proper particle domain model, then we can possibly innovate products far faster than establishment science. There needs to be a reading guide that introduces people to Wal's neutrino sea, Meyl's Scalar Vortex Theory, quantum mechanics and David Thomson's APM. This is the project that I'm working on right now, but it's going to take many months to finish it. Each of these ideas has their own pluses and minuses. All of them can legitimately claim legitimacy. We cannot, and should not, attempt to generate consensus on which is correct. The only consensus we need is with regards to the arguments themselves. Once we learn all of these paradigms, then we can try to figure out tests to evaluate them. The point is that we should not necessarily expect any astrophysical observations to convince the public of the EU. There should be a long-term plan B. Thank you, these were kind of the answers I was hoping for. as that, I hope, will give me some more insight into the history of the subject. viewing the interaction between theory, model and "experienced reality". can be made for EU to be extended in that domain even further, even if it is just tentatively. We cannot, and should not, attempt to generate consensus on which is correct. The only consensus we need is with regards to the arguments themselves. You won me over with that argument. Thank you for the nice use of language. I agree, the astrophysical observations are nice but if one could include the 'quantum'-realm too in a likewise way, it would broaden the picture, so to say. It's why I also would like to see a good biological approach of the matter, just like you said, in view of a long-term plan B. Thanks again Pln2bz, I will try to make my next post again more from the Meyl perspective here. Maybe there will be the possibility to open a Thomson-thread, as that will be needed too, if we are to get a good view of the ideas proposed. Could someone please post here those deleted original Maxwell's equations, or at least a clear reference (URL link) to them? I keep reading about them but they are nowhere to be seen. When people write on this topic and make an important point about these equations, why don't they list them right there and then and show the missing solution? Freely translated this states: "The second derivative of the Electromagnetic potential is proportional to the current density". Which one abstraction level further translates into an energy conservation law: Electromagnetic energy exchanges between EM potential and current density. The individual Maxwell equations can all be derived from this one equation. Inside the booklet Prof. Mead explains many hard to understand EM phenomena in an easy way, e.g. (on p 96/97) why electric dipoles are such efficient radiators for long wavelenght signals (compared to the size of the dipole). I think this can provide a conventional explanation for the effects that are sometimes described to longitudinal waves as done by e.g. Dr. Meyl and Nicola Tesla. On the other hand though I think the Maxwell equations only describe the collective behaviour of electrons (where the mass of the charge carrier can be ignored) and not of mixtures of electrons and ions/protons as inside a plasma. Many effects that Tesla described were plasma effects and are only learned by experimentation and not from Maxwell formula predicted results. On the contrary, Oliver Heavisides reduced theorums have been fully investigated. Maxwells original work in quaternions has been explained by several notable people and fully investigated by few. One must be carefull when applying the term Maxwells Theorum to Oliver Heavisides reduced theorum. Of course 99.99% of the electrical engineers work with the heaviside vectors vs Maxwells Quaterninons. Those who research and function in the orignal work are fully aware of longitudinal energy and that the reduction by Heaviside is a vectoral subset. There are still three pages of recovered material to post on that link so please do not post there until it is finished. Your thoughts are very welcome here and certainly on topic. it's usually the mix up between the originals and the Heavisides. compromise. This slaps the face of the principle of cause and effect. the measurable fields merely are their action at a distance. quantum physical approach to a large extend is exhausted. formative for those minds to get to their ideas.